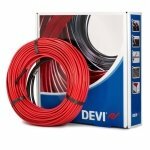 Devi is one of the world leading brands of electric underfloor heating, adding a touch of luxury to any floor. Developed for a variety of applications including domestic and commercial indoor floor heating. Underfloor heating in-screed cables are used primarily in any new build or extension. The heating cables are able to radiate evenly across the whole surface, whilst maintaining its warmth created by a deep layer of flooring - unlike a conventional underfloor heat mat. Subsequently offering an alternative total heating solution, which is economical, efficient and comfortable.